The Farm at Beaman's Fork: Incubator Lockdown... Full House! 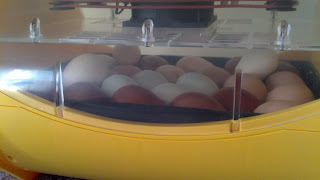 Today marks the time for our incubator to go into "lock down"... a term meaning that we are preparing the eggs for their hatching, set to take place Saturday through Sunday. For lock down, we want to up the humidity from the 40-50% it has been for the last 18 days to 65% for the last three days. This helps keep the eggs' inner membrane moist and pliable for hatching. There are different methods for achieving this higher humidity for each kind of incubator. We have a Brinsea Octagon Advance, which has two long skinny wells in the bottom for water. 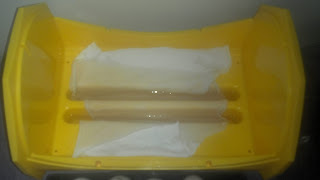 I have found that the best way to raise the humidity is to increase the surface area of the water, and I achieve this by using a scrap of clean t-shirt fabric stretched across the bottom and pushed into the wells. The water is then wicked up through the fabric. The tray of eggs sits on top of this. The second step for lock down is to change the position of the eggs. For the first 18 days, they are propped upside down (pointy end down) and the cradle slowly rocks the entire incubator to keep the insides moving (the rocking also helps lessen the chances of deformed chicks). You can also manually turn the eggs, but I subscribe to the theory of handling the eggs as little as possible during incubation, so we use an automated cradle. For lock down, we lay the eggs on their side and take the incubator off the cradle (or stop manually turning if that is what you have been doing). This helps orient the chicks during their final days in the egg and prepare them for hatching. Our incubator is PACKED this time around. More eggs fertile than we expected! With limited real estate in the incubator, I ended up having to stack a few of the smaller eggs on top of the bigger eggs when I laid them down. The only other choices were to move some to a secondary incubator (that I am not very trusting of -- it has not proven to be very reliable), or cull some of the eggs even though they all show development and movement. Neither good options, so I'll just have to stay on top of monitoring these eggs during the next 3 days and watch for signs of hatching. 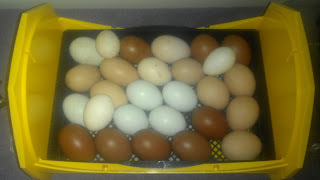 I'll have the help of my friend Autumn, so we can remove chicks as they hatch and make room for the rest of the eggs. Hatch day is expected to be Saturday into Sunday, and we plan to show it live online just like we did last time. Watch this site and/or our Facebook page (or Twitter @WeWantLess) for the live video feed link on Saturday.